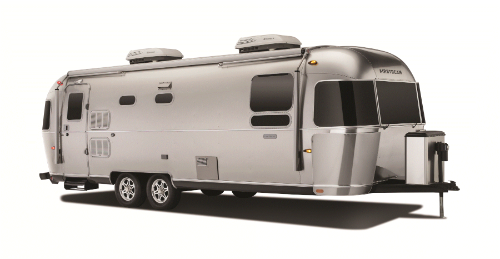 Airstream has an interesting history of building Special Edition models. In past years, they have offered the contemporary Eddie Bauer Edition as well as the rustic-themed Pendleton National Park Service Edition. One of the latest selective models to be conceived – and a departure from its other special trailer predecessors – is the Land Yacht 28, which was introduced in late 2014 and has achieved plenty of attention across the highways of North America. Every special edition model that the company devises carries a distinct theme. What makes the Land Yacht so unique this time around is it was inspired by Airstream leaders of past and present – late company founder Wally Byam and current President and CEO Bob Wheeler as both share a passion for recreational sailing. As Byam inspired many traditional Airstream designs from his passion of travel – on and off the water over the years – Wheeler and his design team commemorated that passion into the Land Yacht 28. The exterior of the Land Yacht. To strengthen the Land Yacht theme, Airstream consulted with Mauro Micheli, the acclaimed yacht designer for prestigious Riva Yachts and co-founder of Oficinia Italian Design firm based in Italy. 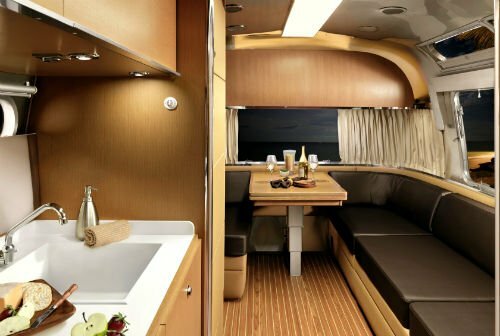 The results were the iconic Airstream profile on the outside with a clean, modern and stylish interior with several forms of function on the inside. Other key appointments are found in the lavy. 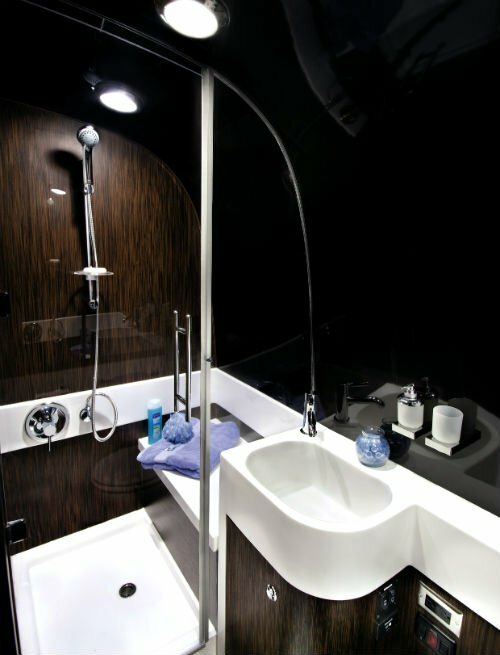 While it’s not uncommon for Airstream trailers to feature the shower and toilet/sink in separate areas of the unit, the Land Yacht has an all-encompassing lavy with the essential components in the same space – with fit and finish executed to the tiniest of detail. Another functional design includes the master bedroom. It comes complete with a power memory foam, pillow top queen mattress, plus under bed storage, however, the standard 30-inch flatscreen TV is cleverly located behind a two-way mirror allowing two common functions in one small area. The all-encompassing head that includes a shower, sink, and toilet in one ideal location. Melton explained that only 45 Land Yachts were scheduled to be built when the model was first introduced. “We build only two a month and have since we began this Special Edition,” he explained. There are only 12 left in the market place across North America and the last one – number 45 – will be completed at the end of September. The Land Yacht is available in two interior colors, Mocha (seen Here) and Polar (shown at top). 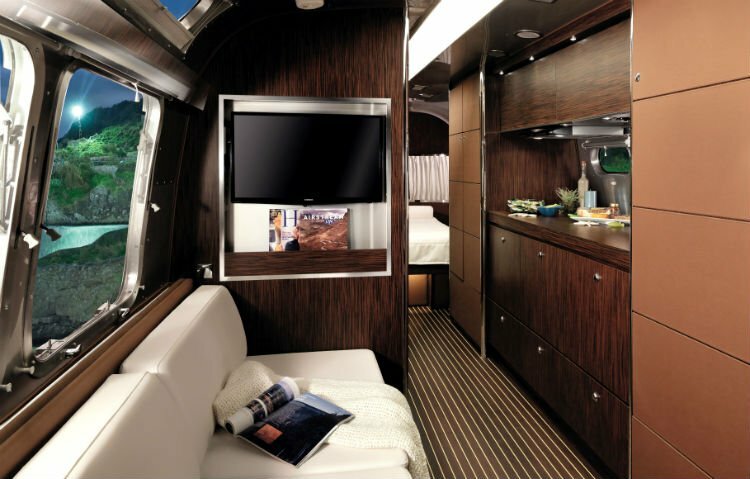 While Special Edition models from Airstream (including the Land Yacht) have a scheduled life span in the consumer marketplace, the influence and design that are incorporated into these models commonly stay within the Airstream brands. There were a series of features introduced in the Land Yacht, with the most popular being the Quietstream ducted A/C, which has become standard on all but the Sport Airstream models. If you have any questions about the company`s Land Yacht Design or wish to join in on the Airstream discussions with other owners be sure to go to AIRForums.com. Fresh Water Tank: 39 gal. Gray Water Tank: 37 gal. Water Heater w/electronic ignition: 6 gal. I had a 31 ft many years ago. Fabulous RV. What scared me sometimes was that it towed so easily that you would forget it was back there. Really. The reason I sold it was that I wanted a motor home and at that time they were not being made. The Airstream Land Yacht looks very nice, appears to be quality built. Looking at the Specifications, the one item that everyone needs to know is not listed. The Price. Most new 25 to 30 foot trailers sell for $20 to $30K. I suspect that that Airstream sell in the $80K range. According to the Airstream website, the Land Yacht starts at $146,362. Hope this helps you.